Did you guys know that spiral macaroni (cavatappi) is also known as scoobi doo? I find that completely hilarious and cute. It makes me want to eat spiral macaroni all the much more now that I know that it has a cutesy name. 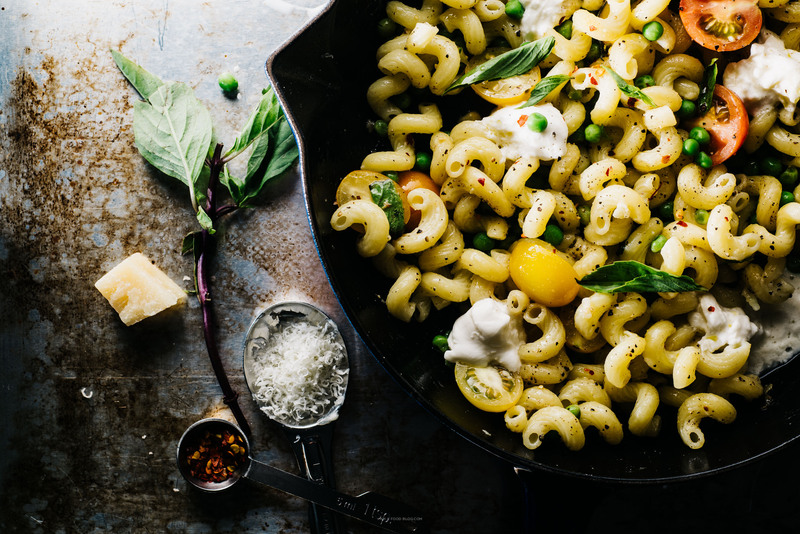 Pet names for pasta aside, this pasta dish is a last summer hurrah. I know we’re in the thick of fall (and winter is coming), but I still see clamshells of hot house tomatoes at the store. The other day I caved and bought a package of rainbow cherry tomatoes because they brought a smile to my face. I went all out and made this dish with a summer-time feel. 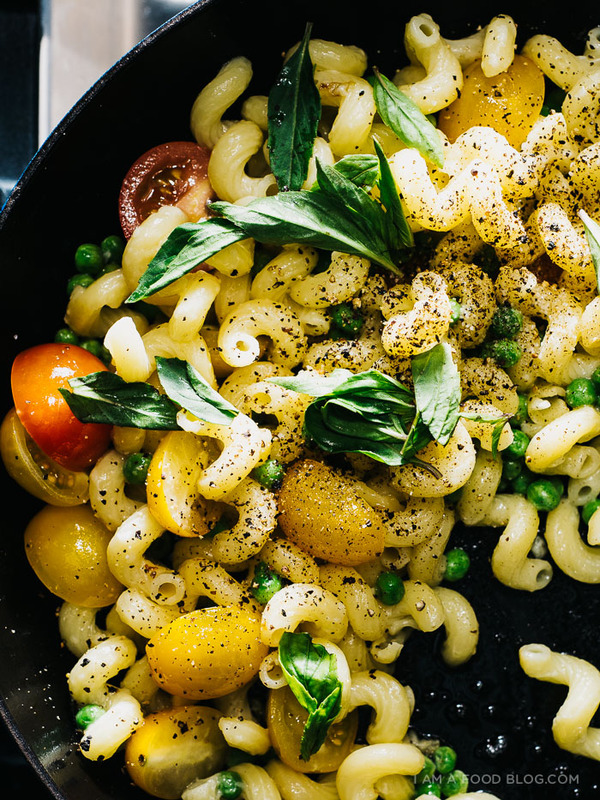 Barely cooked tomatoes and basil tossed with a light and fruity white wine reduction, parmesan, and peas. I also spotted some Canadian burrata at the store and picked that up too, because there’s nothing better than creamy burrata and pasta. This quick and easy pasta is just the way to warm up now that the days are getting chillier and the nights longer. Hope you guys are staying warm! Cook the pasta according to the package. Reserve 1 cup cooking water and drain when done. While the pasta is cooking, melt the butter in a large pan over low heat. Add the garlic and cook, stirring occasionally, until soft, but not brown. Add the white wine and turn the heat up and reduce slightly. 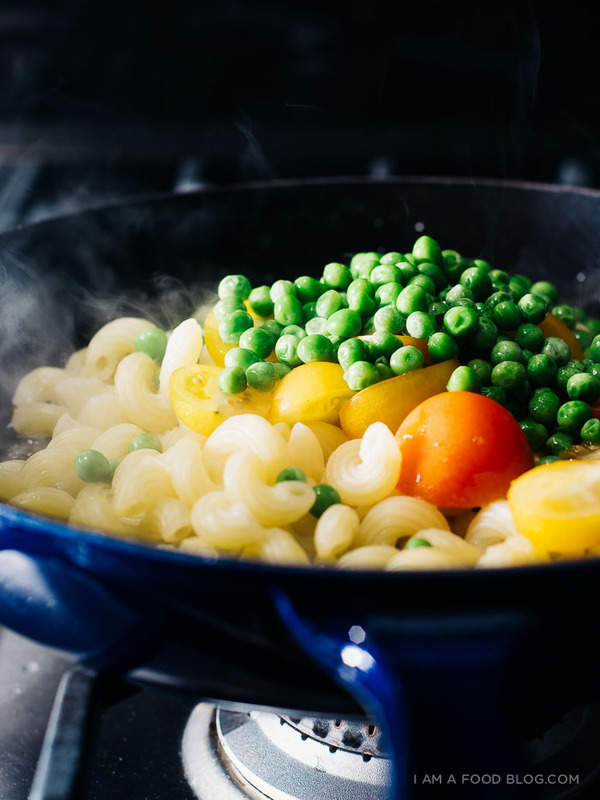 Add the drained pasta, tomatoes and peas and mix well. Stir in the parmesan, adding a splash reserved pasta water if the pasta is dry. Stir in some chopped basil. Taste, and season with salt and pepper. To serve, top with pieces of burrata, a drizzle of olive oil, basil and red pepper flakes if desired. Enjoy immediately! This post was sponsored by Dairy Farmers of Canada. Thanks for supporting I am a Food Blog! i was expecting the famous dog, or perhaps his female counterpart (because it’s scoobi with an i, not a y). anyways, i swear you always teach me new terms- i’m remembering the post when you talked about another word (which is currently not coming to my brain) for coziness. 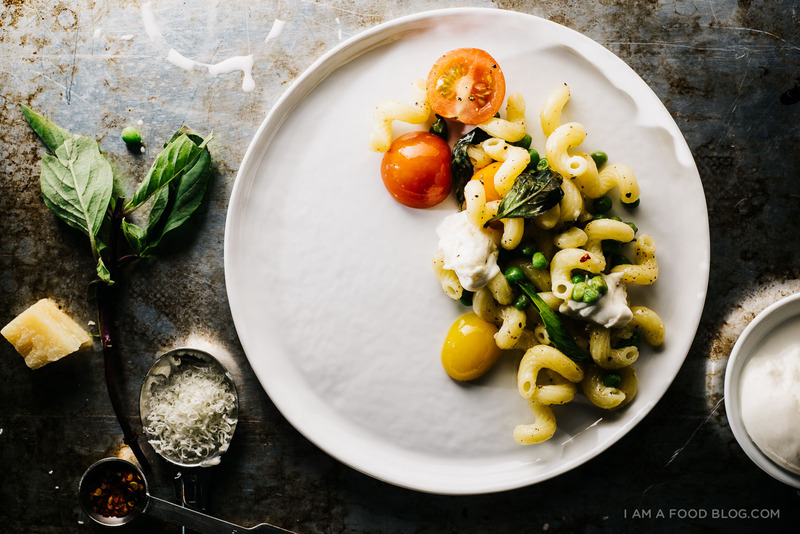 This simple pasta sounds delicious! Those noodles are so much fun on their own aren’t they?? 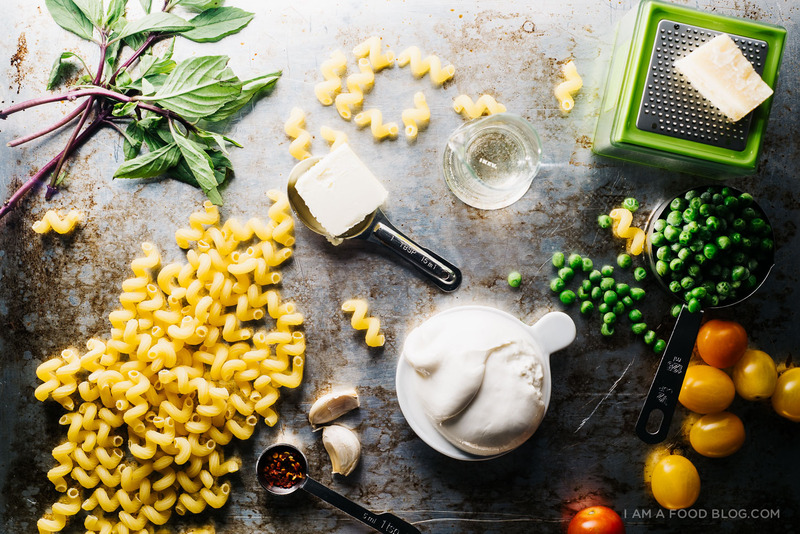 Nothing is better than simple pasta dishes. Longing to try this one! They ARE?!? That makes me love cavatappi (excuse me, SCOOBI DOO) even more!! And I loooove this late summer pasta — anything to hold onto summer is welcome in my book, any time of year. Looks so so good, Steph! 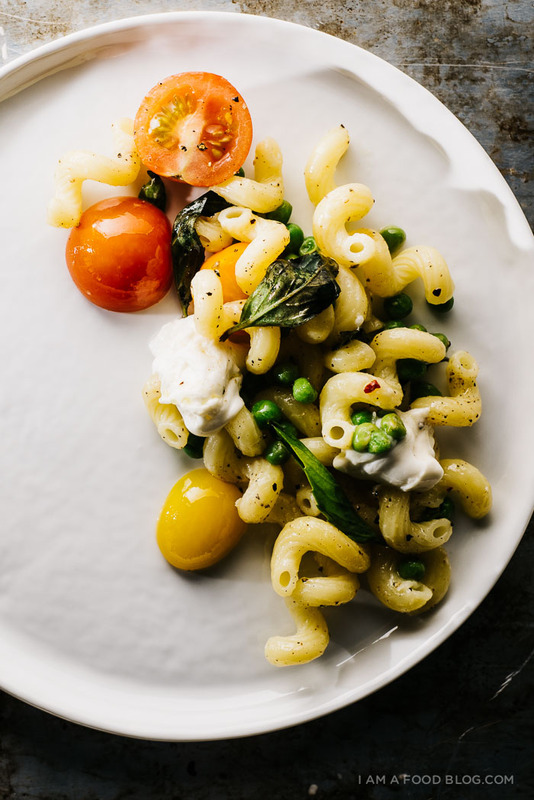 This sounds amazing, and cavatappi is my favourite pasta shape. I make something similar with tomato and goat cheese, but I’ll have to try it with burrata. Officially calling cavatappi “Scoobi Doo” now! I love it. Also, LOVING burratta so this dish look so amazing. And yay for those last few tomatoes! Hang on to them while they last! Uh, what’s 1/4 cup of white white? Yes for using my all time favourite pasta shapes! 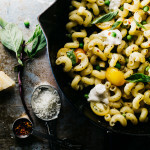 Can this be done like your one pot pasta dish: http://iamafoodblog.com/one-pot-pasta-tomato-basil-and-burrata-spaghetti/ ? to be honest, i haven’t tried – you’d have to play around with the ratios a bit. but i think this application works better, just because you cook off a bit of the white wine taste while reducing it. I just learned what burrata is! Now I need to make all the recipes. This looks delish! This recipe was KILLER. My husband and I enjoyed it very much. PLUS, we’ve ever eaten Burrata cheese before, and we LOVE It! I made my Mac “n “Cheese with Scoobi Doos and I will never go back to using regular elbow macaroni noodles! These are firmer but not overly firm. My husband bought them by mistake … but he is more than forgiven! I will use these in soups too! !